(Excerpts from studies undertaken under contract for the National Academy of Sciences and dthe Office of Naval Research and from review of the literature. Most photographs obtained from archives of the International Tsunami Information Center). The Great 1964 Alaska earthquake generated catastrophic tsunami waves that devastated many towns in the Prince William Sound area of Alaska, along the Gulf of Alaska, along the West Coast of Canada and the United States, and in the Hawaiian islands. In Alaska, the tsunami run-up measurements varied from 6.1 m at Kodiak Island, 9.1 m at Valdez, 24.2 m at Blackstone Bay, and 27.4 m at Chenega. The Great 1964 Alaska earthquake and the tsunami waves resulting from it, took the lives of more than 122 people and caused over $106 million (1964 dollars) in total damage. A total of 119 people lost their lives in Alaska, Oregon and California as a result of tsunami waves generated in the Gulf of Alaska and the locally generated tsunami waves in Prince William Sound. 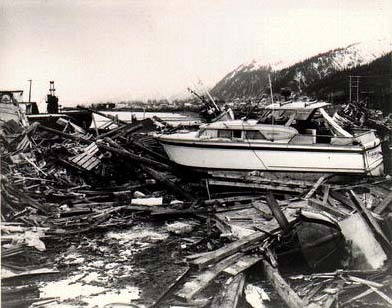 Most of the damage and most of the lives lost in Alaska were due to large local tsunami waves within the Prince William Sound area, rather than to the earthquake itself. Of the 119 deaths attributable to tsunami waves, about one-third were due to the open-ocean tsunami generated in the Gulf of Alaska. Of these 4 occurred at Newport Beach, Oregon; 12 at Crescent City, California; and about 21 in Alaska. The rest of the deaths were caused by tsunami waves generated within Prince William Sound. Although most studies refer to the March 27, 1964 Great Earthquake in Alaska as having generated one single tsunami, in reality there were two different types of very distinguishable tsunami generation mechanisms associated with this earthquake: one along the continental shelf bordering the Gulf of Alaska; the other, in the Prince William Sound region. The Open Ocean Tsunami: Tectonic movements of the sea floor were responsible for the generation of the open ocean tsunami along the continental shelf bordering the Gulf of Alaska. Destructive tsunami waves from this generating area were responsible for destruction on Kenai Peninsula, on Kodiak Island, on Trinity islands, on Vancouver Island, the West Coast of United States and the Hawaiian islands. Very little energy from this main tsunami entered the Prince William Sound area. Most of the energy from the open ocean tsunami generated in the Gulf, radiated in a southeast direction towards Canada, the Western United States, and the Hawaiian Islands. 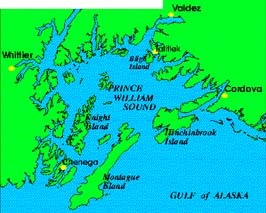 The Prince William Sound Tsunami Waves: Tectonic movements and resulting landslides were responsible for most of the local tsunami waves which caused the destruction and deaths within the Prince William Sound region. Very little of the energy from these local tsunami waves escaped the Sound, thus contributing very little, if at all, to the overall tsunami energy of the open ocean tsunami along the Gulf of Alaska. Most of the tsunami energy from the local tsunami waves stayed within the Sound, reverberating and, in the case of Valdez Bay, setting up resonance effects and maximum inundation, hours after the earthquake. Since the mechanisms of tsunami generation for these two regions differed, they are discussed separately in these pages. The generating area and the source mechanism of the March 27, 1964 open ocean tsunami in the Gulf of Alaska, as well as the seismic parameters of the earthquake have been discussed elsewhere. This section presents only a summary of the generation and effects of the open ocean tsunami on the coastal area of Alaska in the Gulf, outside Prince William Sound. The Dimensions of the Open Ocean Tsunami Generating Area are discussed in detail under the source mechanism study. Essentially, the overall tectonic dislocations associated with the Alaska earthquake of 27 March 1964, which contributed to the generation of the open ocean tsunami in the Gulf of Alaska, ranged over a distance of 800 km, from the upper portion of Prince William Sound to southwest of the Trinity Islands. As the adjacent drawing shows, the dislocations follow a dipole pattern of positive and negative displacements on either side of a zero-line which, intersecting the east coast of Kodiak Island, continues northeast to the western side of Prince William Sound. As shown again in the adjacent drawing, the areas north and west of this Zero line underwent negative elevation changes whereas the areas east and south underwent positive changes. Wave refraction studies described in the source mechanism study, also strongly indicated that the tsunami-generating area was mainly in the belt of uplift and included a large segment of the continental shelf and slope. 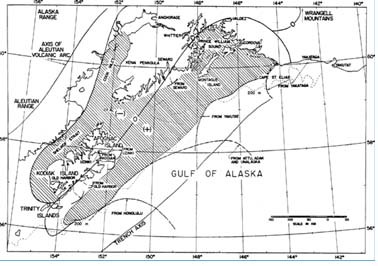 Open-Sea Total Tsunami Area: Estimates of the total area of tectonic displacements associated with the Alaska earthquake of 27 March 1964 have been revised upward to be as much as 520,00 square kilometers. This is the largest area known to be associated-with a single earthquake within historic time. Only a portion of this total area of displacements, approximately covering 215,000 square km, contributed to the generation of the open sea tsunami. This covers an area of uplift of about 105,000 km2 (sq. Km) and an area of subsidence approximately 110,000 km2 (sq. Km). Tsunami Generating Area and Earthquake Aftershock Distribution: The open sea tsunami generating area corresponds well with the distribution of major earthquake aftershocks. This aftershock distribution zone extended from the Prince William Sound area to about 55 km. south of Trinity Islands with heavier concentration on the northeast and the southwest of the uplifted region which was also the tsunami generating region. Boundaries of Tsunami Generation Area: The boundaries of the generating area of the tsunami in the Gulf of Alaska extended from southern Kodiak Island (near Trinity Islands) northeast to Prince William Sound. Within the Gulf of Alaska, the zone of deformation to the east appeared to die out between the Bering Glacier and Cape Yakataga. The width of the generating area is estimated at 150 km, and includes the Gulf of Alaska coastal area as far east as the Bering Glacier, and the continental shelf and part of the slope. The northward limit of the tsunami generating area is restricted by the land boundaries, and the western limit extends to the west side of Shelikof Strait and Cook Inlet. The seaward limits of the open sea tsunami-generating area, determined by means of tsunami wave refraction (see Source Mechanism study) show the seaward boundary to be near the 200-m depth contour which defines the edge of the continental shelf. Volume of Crustal Displacements Contributing to Tsunami Generation: The total volume of dislocations which contributed to the open sea tsunami on the Gulf of Alaska has been estimated at about 115 to 120 km3 (cubic km). Total Energy of the Open Sea Tsunami: The energy associated with the open sea tsunami in the Gulf of Alaska was estimated to be in the order 6 x10 (raised to the 21st power) in ergs. Tsunami Wave Periods: The waves generated in the Gulf of Alaska were of unusually long period on the order of an hour or more. The long period of the waves generated in the Gulf of Alaska, is related to the long seiche period of the shallow shelf. Energy Radiation: Tsunami energy radiation was preferentially directed towards the south east and this is why more damage was done to the North American coast than anywhere else east or south of the generating area. The preferential radiation of energy towards the southeast is attributed to the orientation of the tectonic displacements along the continental shelf of the Gulf of Alaska. 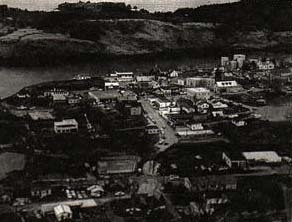 Kodiak Island: The shores of the Kodiak Island were struck by tsunami waves within 34 minutes after the earthquake. The only reliable tide gauge record from the generating area is the one obtained by personnel of the U. S. Navy Fleet Weather Station at Kodiak (see figure) This record has been for the 1.7 m ((5.6-foot)) submergence of the area as determined from tide gages of USC&GS (1964). The third and fourth waves were the highest and most destructive at Uzinki, Kodiak City, Women's Bay and elsewhere on the island of Kodiak. The significance of this is that, if the tsunami waves that hit the island of Kodiak were the result of only crustal movements, then the first wave could be expected to be the highest, at least within the generating area, where indeed Kodiak island was located. However, since the third and fourth waves were the highest, a theory of generation from a single pattern of crustal deformation is not satisfactory. Thus we must conclude that the pattern of crustal deformations was indeed complex and factors such as as reflection from coastal boundaries, wave interaction, refraction, diffraction and resonance, contributed to subsequent waves being the highest. Kenai Peninsula: The shores of the Kenai Peninsula were struck within 23 minutes after the earthquake. Withdrawal of the water immediately following the earthquake has been reported from Kayak, Middleton, and Hinchinbrook Islands, as well as Rocky Bay and Nuka Bay, at the end of the Kenai Peninsula, but these islands are inside the generating area. Yakatat: At Yakatat, a coastal town 170 km southeast of Cape Yakataga, had a tide gage in operation, and the marigram shows that a positive wave arrived first . Cape Yakataga: Outside the immediate generating area., the record of Cape Yakataga, as constructed from the personal account of C. R. Bilderback, a resident of the area, is the next most reliable record. This record is the only one obtained outside the generating area that shows an initial drop in the water level. It is quite possible therefore that the first waves to arrive at Cape Yakataga had a different origin from that of the first waves to arrive at Yakatat. It could very well be that the Cape Yakataga waves traveled aver the shallow portion of the shelf, whereas the Yakatat waves came from the open ocean. It is concluded that the wares arriving at Cape Yakataga had their origin in the shallow coastal area near Bering Glacier, whereas the waves arriving at Yakatat traveled from a different path through the deeper waters of the Gulf of Alaska. An interesting aspect of these two records is that of the difference in amplitude and period of the first waves to arrive at these two sites - which also supports the hypothesis of difference in origin. Field Survey of the Tsunami of 28 March 1964 in Alaska,Hawaii Inst. Geophys. Rpt. Tsunami Activity Accompanying the Alaskan Earthquake of 27 March 1964, U.S. Army Engr. Dist., Alaska, ms., 20 pp. COULTER, H. W. and R. R. Migliaccio, 1966. Effects of the March 27, 1964 Earthquake at Valdez, Alaska, U.S. Geol. Survey Prof. Paper 542-C, 36 pp. COX, D.C. and Pararas-Carayannis, George. A Catalog of Tsunamis in Alaska. World Data Center A- Tsunami Report, No. 2, 1969. GRANTZ, A.G., G. Plafker, and R. Kachadoorian, 1964. IIDA, K., D.C. Cox, and Pararas--Carayannis, George, 1967. Preliminary Catalog of Tsunamis Occurring in the Pacific Ocean. Data Report No. 5. Honolulu: Hawaii Inst.Geophys.Aug. 1967. IIDA, K., D.C. Cox, and G. Pararas-Carayannis, 1967b. Bibliography to the Preliminary Catalog of Tsunamis Occurring in the Pacific Ocean, Hawaii Inst. Geophys. Data Rpt. 6, HIG-67-25, Univ. of Hawaii, 27 pp. Catalog of Tsunami in the Hawaiian Islands. World Data Center A- Tsunami U.S. Dept. of Commerce Environmental Science Service Administration Coast and Geodetic Survey, May 1969. "Source Mechanism of the Water Waves Produced." Reprinted from Pacific Science, Vol. 21, No. 3, "A Study of the Source Mechanism of the Alaska Earthquake and Tsunami of March 27, 1964." Volume on Seismology and Geodesy on the Great Alaska Earthquake of 1964, National Academy of Sciences, Washington D.C., pp 249-258, 1972. SPAETH, M.G. and S.C. Berkman, 1965, 1967. 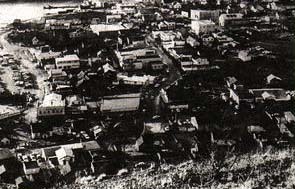 Tsunami Damage at Kodiak, Alaska, and Crescent City, California from Alaskan Earthquake of 27 March 1964, U.S. Navy Civil Engr. Lab, Port Hueneme, Calif., Tech. Note N-622, 124 pp. Source Motion of the Tsunami of March 28, 1964 in Alaska, Proc. 9th Council on Coastal Engr., Trans. Am. Soc. Divil Engr. The Alaska Earthquake...its Effects in Canada, Canadian Geogr. Journ., v. 72, no. 6, pp. 210-219.